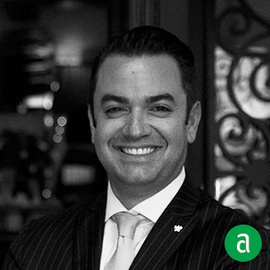 Jeff Katz, Partner at The Restaurants at 70 Pine and Managing Director at Del Posto in New York City, shares his career timeline and advice for up-and-coming talent. Never forget the rules, regardless of how casual and relaxed your work environment might be. Remember the policies of your business, and the letter of the law of the state you work in. I was taught by my mom to treat people the way you want to be treated—Everyone, not just people you want something from. Deal with interpersonal problems immediately. Don’t sweep problems under a rug or pretend they don’t exist. If you have a problem with a colleague–hash it out. If you need a manager or a mediator–find one. But don’t let the problems fester, it will only get worse. One of the most incredible things about working in this industry is being able to meet and make so many friends as your career progresses. The people and management of each restaurant creates its culture. Find a place that fits your personality and STAY THERE. Learn as much as you can. Learn beyond food and wine knowledge. Learn beyond appropriate service. Learn what makes the restaurant tick. When opportunity knocks, walk through the door. I promise that door will open, just wait for it. It’s never as bad as it seems. Stress and tension don’t make problems easier to deal with. Keep calm and carry on–that must be a restaurant saying. And remember with every job, you are constantly being taught how to do and how NOT to do something–pay attention to both.